Can I Get Metal-Free Dental Implants in Albuquerque? “Metal-free dentistry” is a bit of buzzword these days. As more and more patients are becoming interested in dental treatments that are good for their whole body, they are opting for white fillings over metal ones, and they’re always ready to learn about holistic alternatives to traditional treatments. But what about when it comes to dental implants in Albuquerque? Is there a metal-free way to take advantage of this tooth replacement method? Allergies to titanium are extremely rare. Titanium has the ability to bond with the tissue around it, creating a firm bond between the implant and the bone that supports it. Titanium is both strong and light. Titanium has a low thermal conductivity, which means that it helps to reduce irritation when an implant is exposed to hot or cold temperatures. Zirconia implants are often marketed as a “metal-free” alternative to titanium. However, it is important that you understand that zirconium, one of the main components of zirconia implants, has an atomic number of 40. On the periodic table of elements, it is considered a transitional metal. Therefore, there are no true metal-free alternatives to titanium implants. Zirconia can easily form microcracks when it is adjusted. These microcracks increase the risk that an implant will break altogether later on. Usually, restorations (artificial teeth) have to be cemented onto zirconia implants rather than screwed on. If it becomes necessary to remove or adjust a cement-retained restoration, there is a significant risk that it will break. Screw-retained artificial teeth are necessary for patients undergoing full-mouth reconstruction. Therefore, individuals who have experienced extensive tooth loss are not candidates for zirconia implants. If you’re still concerned about the metal in dental implants, write down your questions and schedule a consultation with an implant dentist in Albuquerque. They will be happy to discuss the details of the procedure with you and address any worries you might have about using titanium implants to replace your missing teeth. Then, you can make a truly informed and confident decision about how you want to rebuild your smile. Titanium is a remarkable, biocompatible material. 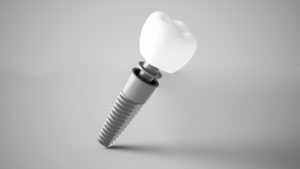 When it comes to dental implants, there is no need for metal-free treatment! Dr. Monica Boehmer is one of the top dentists in the Albuquerque area; she is a true expert at designing dental implant restorations. To learn more about how she may be able to help you regain your lost smile, contact our office at 505-271-8009. Comments Off on Can I Get Metal-Free Dental Implants in Albuquerque?